The THAAD issue has South Korea caught between Beijing and Washington. How can all three countries move forward? South Korea has been an ally of the Unites States for over 60 years. Over the decades, there have been numerous defense issues between the two allies. The latest issue hanging over the U.S.-South Korea alliance is the deployment of THAAD (Terminal High Altitude Air Defense), which catches Seoul between conflicting pressures from Washington and Beijing. Commander of U.S. Forces in Korea General Curtis Scaparrotti, the highest U.S. military official in the country, recommended Seoul deploy THAAD to protect itself from the threat of North Korean missiles. But during a meeting between Chinese Defense Chief Chang Wanquan and South Korean Minister of National Defense Han Min-Koo, China publicly expressed its concerns over America’s proposal to deploy the air defense system. Mindful of Chinese concerns, Seoul’s official stance is the “three nos,” meaning no decision has been made; there was no consultation with the United States, and no request from Washington. Americans want Koreans to say yes to THAAD; the Chinese want Koreans to say no. Meanwhile, Seoul is hesitant to provide an official stance. Amid the THAAD debate, there are three questions to be answered; why Beijing is concerned, why Seoul is staying quiet, and what the three stakeholder countries should do. Why is Beijing concerned about extended American air defense capability in Northeast Asia? China believes that THAAD will not only operate to protect the Korean Peninsula from North Korean missiles, but will also monitor Chinese air activity off the east coast of the Chinese continent and shoot down Chinese missiles as required. However, it is unlikely that China would launch missiles to strike U.S. assets in the Pacific. Both Washington and Beijing are aware of the catastrophic consequences of a clash between the two superpowers. China should not be concerned about America’s ‘shield’ as long as Chinese missiles will not strike U.S. assets. THAAD is not aimed at China, but directed at North Korea. Why is Seoul staying quiet? Seoul maintains its strategic ambiguity in order not to be forced to choose between its economic and security interests. Currently, the South Korean economy is heavily dependent on Beijing, China is both its largest exporter and importer (China, including Hong Kong, accounts for 31 percent of exports and 16 percent of imports). At the same time, South Korea is well aware of the national security benefits of a U.S. military presence in the country. Even though South Korea boasts one of the most powerful armies in Asia, it still heavily relies on U.S. ISR (Intelligence, Surveillance, and Reconnaissance) capabilities and is likely to rely further on U.S. air defense capabilities if THAAD is deployed. Since both economic interests and security interests are important, Seoul is reluctant to accept the U.S. proposal (which could cause estrangement in the South Korea-China relationship) but equally hesitant to reject the air defense system. What should the three countries do? First, Beijing must understand that the deployment of THAAD is ultimately beneficial for China. Foreign Ministry Spokesperson Hong Lei’s regular press conference on April 9, 2013 shows that China wants the deterrence of armed conflict, stability, and peace on the Korean Peninsula. Beijing is well aware of the tragic consequences of conflict should North Korea miscalculate and inflict damage on its rival to the south. If South Korea remains exposed to North Korean missile threats and is eventually attacked, the safety of more than one million Chinese living in South Korea will be at risk. Besides possible Chinese casualties, the turmoil of the South Korean economy will directly impact Chinese interests. When the U.S.-South Korea alliance strikes back, they may decide to put an end to Kim Jong-un regime, meaning millions of North Korean refugees will rush to the border with China seeking food, water, and survival. The consequences of North Korean missile use on the Korean Peninsula will not be contained within the peninsula; it will directly threaten Chinese interests as well. Second, Seoul has to send a clear message to Beijing that deploying THAAD is an inevitable option in pursuit of national security because the country is still vulnerable to North Korean missile threats. 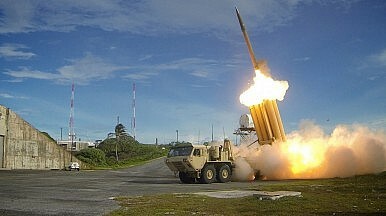 Despite efforts of the South Korean Ministry of National Defense to protect the country by building two key air defense components — Kill-Chain and KAMD (Korea Air and Missile Defense system) — the country will remain exposed to missile threats until 2024, when the air defense system is expected to be operational. Plus, a key component of KAMD, the PAC-2 (Patriot Advanced Capability) system, is not a reliable provider of air defense. Due to a limited number of sensors and shooters, it is impossible to detect and destroy hundreds of North Korean mobile missile launchers. However, Seoul cannot let its sky remain exposed to threats until 2024. THAAD could provide bridging capability with its 100 percent success rate, as shown by U.S. Missile Defense Agency tests. It will be a reliable shield against North Korean missile threats until the air defense systems are complete in 2024. Plus, more than half of the Korean public supports deployment of THAAD for national security. Deployment of THAAD is an inevitable option to defend South Korean national security. Seoul must emphasize that interests of a neighboring country cannot outweigh ROK national security concerns, including the need to protect civilian lives and property. Third, Washington should clarify that THAAD deployment is not intended to harm Chinese interests and should directly talk to Seoul through an official channel regarding the THAAD issue. There has been no official communication among Washington, Seoul, and Beijing. While the U.S. stays silent, China is openly expressing concerns over the American air defense system and South Korea is hesitant to answer. Unless the U.S. clarifies its purpose, China’s misunderstanding will grow deeper, adversely affecting the U.S.-China relationship. In addition, Washington should urge Beijing to take more active measures to prevent miscalculations by North Korean leadership. By doing so, Washington could deliver a strategic message that the U.S. truly intends to cooperate with China for stability and peace in Northeast Asia. Washington should not just wait for Seoul to respond; more active and direct communication with stakeholder countries is required to minimize misunderstandings. David Eunpyoung Jee is a Korea Foundation Associate Researcher of the Asia-Pacific Security Program at the Center for a New American Security. He previously served as a military officer at the operation center of Republic of Korea Joint Chiefs of Staff and Army Missile Command. China's overreaction to THAAD misses the key point of the deployment.